Welcome to the next Coffee Spot Awards Shortlist for 2014, the “Most Passionate About Coffee” Award, which was won in 2013 by Workhouse Coffee, King Street. For me, this is one of the most important awards, and also one of the hardest to judge, which is why I’ve left it to the last day. I’ve long admired Reading’s Workhouse Coffee, both as a roaster and as the operator of two fantastic cafes. However, the other thing that shines through is the sheer passion for the coffee. Workhouse was also nominated for the Happiest Staff Award and won this award last year! A legend amongst coffee enthusiasts and credited as an inspiration for a whole generation of coffee shops and roasters in the South West, the passion of Colonna & Small’s has never been in doubt. Also in the running for the Most Popular Coffee Spot Award. In the unlikely setting of London’s Queenstown Road Station, Coffee Affair is passionate about all sorts of things, not just the excellent coffee. The coffee really in excellent though, with so much crammed into a what, when all’s said and done, is a pretty small spot. One of London’s unsung gems. Also nominated for Best Coffee Spot Near a Railway Station and Smallest Coffee Spot Awards. Out on Oxford’s Cowley Road, Quarter Horse Coffee has imported some Chicago coffee passion via London and with excellent results. Bringing London roaster Square Mile to Oxford, Quarter Horse also started doing filter coffee (bulk brew, betraying co-owner Nathan’s American origins, and Aeropress). It also continues its coffee education/evangelism with regular events such as monthly cupping classes and a general all-round enthusiasm for great coffee. 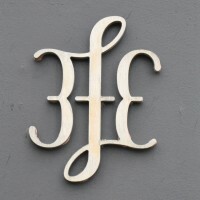 Dublin’s 3FE is both coffee shop and roaster, where the bean is first and foremost. In an innovative move, 3FE only serves single-origin beans, offering a choice of three, which can be had as espresso or filter. This makes for a refreshing coffee menu, since it only lists the beans, not the brew methods, shifting the focus back onto the coffee itself. 3FE has also been nominated for the Happiest Staff and Best Overseas Coffee Spot Awards. Although I often write about Coffee Spots which are firmly associated with an individual (Charlie’s Coffee Shop in St Albans springs to mind), this is the first time I’ve really written about an individual, the irrepressible Edy Piro. Edy is a force of nature who is never without a smile, and has a contagious passion for great coffee. A roaster, barista and coffee shop owner, Edy Piro is also the Coffee Spot’s number one photo-bomber. Sharps Coffee Bar, on London’s Windmill Street, is one of a new breed of coffee shops sharing premises with other businesses, in this case, a barbers. I’ve tracked its progress over the last year and seen it become more accessible to the average customer, but lose none of its passion in the process. And, of course, I go to drool over the Kees van der Westen Spirit Triplette, but don’t tell anyone! 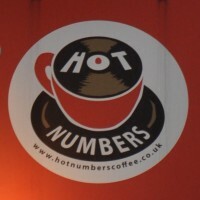 Hot Numbers in Cambridge is a café, single-origin roaster, music venue and, by association, art gallery. While it’s got something for everyone, there’s more than enough here to satisfy any coffee geek, including a choice of two espresso beans (with milk and without) as well as decaf. 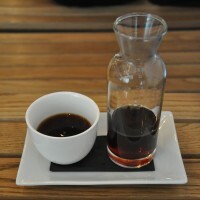 Another single-origin is on offer as filter coffee through Aeropress, Clever Dripper and Syphon. CRAFT London is a new project by chef Stevie Parle and designer Tom Dixon. As the name suggests, it’s focused on the craft of making things. 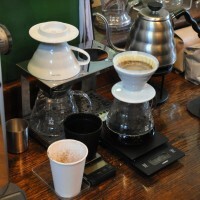 One of those things is coffee, which will be roasted on site, and with a focus on single-origin, filter coffee. 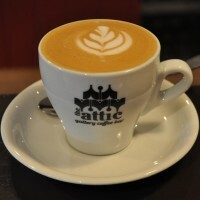 The Attic Gallery Coffee Bar, occupying the floor above York’s Harlequin Coffee and Tea House, is the speciality coffee wing of the operation. Serving a variety of Has Bean coffee through a variety of methods, I learnt so much just by sitting at the counter and talking with (and listening to) owner/head barista, Gordon. The Attic has also been shortlisted for the Best Espresso Award.